As we explore the landscape of card printers and manufacturers, SecureIDNews editors caught up with Jean-Gabriel Martin, marketing communication manager for Evolis. The French company currently ranks as a market leader in terms of units sold and boasted sales of more than 75 million euros in 2015. With more than 300 employees and distributors in 140 countries around the globe, Evolis has quickly progressed from a spinoff to a major player. Q: Starting a printer manufacturing company from the ground up is no easy feat. Tell me how Evolis was created. Where did the founders come from and why did they see an opportunity in a new manufacturer of card printers? JeanGab: In the 1990s, four of the five founders of Evolis occupied senior positions at Privilège Card, a small French company that specialized in the production of plastic card printers. The company’s production site was located near Angers, close to the current headquarters of Evolis. The current president of Evolis, Emmanuel Picot, was head of sales and marketing at Privilège Card, Evolis vice-president Cécile Belanger was chief financial officer, the research and development department was headed by Didier Godard and Serge Olivier was software engineer. After several years of strong growth, Privilège Card merged with the American company Eltron, which at the time was the second largest manufacturer of labeling printing systems. The combined company became Eltron Card Printer. In 1998 this French-American group was bought by the American company Zebra. Throughout these transitions, the production site continued to be based in Angers, and the founders of Evolis continued to take on further responsibilities at international level. The fifth founder of Evolis, Yves Liatard our industrial designer, arrived at that time. In 1999, Zebra decided to close the French factory and relocate production to the U.S. Anxious to preserve the jobs of the employees in Angers and convinced they had all the skills to build a new company, the five French managers founded Evolis and were quickly joined by ten ex-employees from Zebra. Sixteen years later, Evolis has become the world leader in terms of volume for desktop printing and personalization systems. Q: To my recollection, the initial Evolis product line was focused on compact, affordable printers. Over the years, however, the offerings have expanded across the range. Can you give me a bit of history of the product line? JeanGab: Our first products Pebble and Dualys were indeed situated in the mid-range price segment and excelled through user-friendliness and compactness. Our ambition was to offer the best price/quality/performance relation. In 2003 we launched Quantum which is still our semi-industrial solution for large-scale batch printing. The same year we also launched the Tatoo Rewrite printer with an exclusive rewritable technology. In 2007 we launched Securion, an advanced printer for highly secure cards including holograms and lamination options. It was designed for issuers of secure access control badges, government ID cards and driver licenses. We know that only ongoing innovations enable a company to remain at the top. That’s why from 2010 onwards, we completely reviewed our product strategy and developed solutions that met all the needs that could exist in the market – from the entry-level product to the high end tailor-made solution. 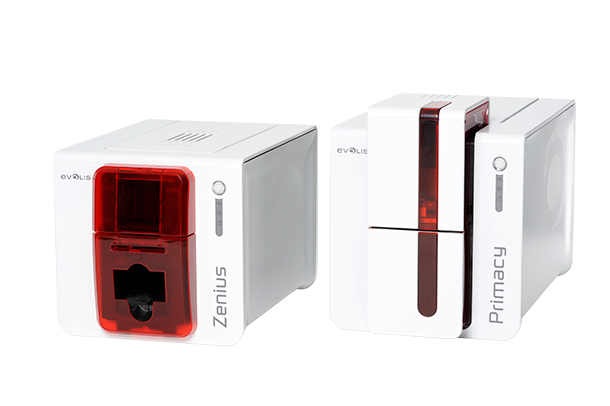 The models Zenius and Primacy in the mid-range segment replaced our original flagship products. They feature field-upgradable advanced encoding technologies and high printing speeds. Today, they are our most sold products. Avansia is our product for the high-end segment, which uses the retransfer technology for high-resolution card printing. In 2014 we launched the entry level product Badgy, which is sold through IT office dealer networks to small companies, schools, sport clubs and associations who need a good price/quality product for small volume printing. Evolis High Trust, a new range of consumables for all printer models featuring superior graphic quality, was also developed during this period. Today we sell much more than card printers and consumables. We have diversified our product portfolio with digital signature pads, software included in our printers developed by our new subsidiary CardPresso, accessories through a new subsidiary called Sogedex and services such as warranty extensions, customized training and integration services.